3. Upload the HTML file to your website and embed it with iframe. Of course, you can use HTML files as standalone web pages without any embedding too. The second method is an alternative to the first and the result seemingly looks the same: 3D content with control elements is embedded in a web page. Nevertheless, this method of embedding is different: instead of a single HTML file, a combination of the Web Player and a separate JSON file is used. Where do you get the Web Player? You can copy the whole directory blend4web/deploy/apps/webplayer/ with the Web Player files from your Blend4Web SDK and deploy it on your website. JSON files can be exported in the same way as the HTML files File > Export > Blend4Web (.json). Upload your exported .json file (with the accompanying .bin file and possible textures) to your website and specify the path to it with the load attribute. Both absolute and relative URLs are supported. Learn more about features of the Web Player in the corresponding section of the User Manual. If you try to launch this app locally (not from a remote web server), it won't run due to the same-origin policy. For loading and viewing exported .json files we recommend using the Project Manager. With the Project Manager you can also create production-ready apps based on the Web Player without the need to copy files manually. 4. decoupled from the Web Player's code and are not subject to the licensing as it is with HTML files. Finally, we can convert the web page itself into an interactive 3D application! Let's demonstrate this with a simple example: we'll place a button on this page to trigger interesting animation. Check it out: the page content can be viewed through translucent animated balloons with volumetric highlights. Plus, there is a magical sound! The stripped version can be seen live here. The source files can be found in this SDK folder: apps_dev/tutorials/web_page_integration/. How this animation effect was created is described in this article. Now, let's look at how it was integrated with this page. This isn't any more difficult than making something similar with jQuery or the fading Flash. Once again, it is very convenient to use the Project Manager to create a full set of application files (HTML, CSS, JS) and modify them instead of creating everything from scratch. After the loading is complete, the load_cb() callback is fired. Inside this function, we can start manipulating our 3D scene. First, we stop the armature animation because it was set to auto-play in Blender settings (our 3D artist used skeletal animation for balloons and it was convenient for him to tweak the animation outside the app). ...and run the animation of flying balloons. So simple! WebGL gives the unique opportunity to seamlessly integrate interactive 3D content with other web technologies. With Blend4Web, you can easily create such content with Blender, deploy it on web pages and combine it with any HTML elements. [2014-10-30] Updated links to the web player. Added allowfullscreen attribute. Removed deprecated bg parameter. [2015-04-23] Updated file path to webplayer sources. Updated variable and animation names. Removed deferred_rendering and context_antialias parameters from m_app.init() function. [2015-05-15] Added CSS style description. Rendering area resize logic replaces from script to CSS table. Added link to standalone application. Added resize() function description. [2016-04-08] Standalone B4W add-on is no longer mentioned to discourage its use. Fixed links. Removed show_fps URL attribute to simplify things. Added info about the Project Manager. Removed all CSS code and simplified code explanation. [2016-06-16] Added the possibility to use physics to the benefits list of the second method. Clarified other items in that list. [2016-09-21] Added an advice to use the Project Manager for creating apps. [2017-03-22] Updated the link to the licensing options. Fixed the links to the #3 app sources. I'm using <iframe allowfullscreen src="path/to/apple.html" width="800" height="500"></iframe> or method #1, how can I adjust the 3D content inside ? and how can I remove or hide the Control Panel button?? I'm using <iframe allowfullscreen src="path/to/apple.html" width="800" height="500"></iframe> or method #1, how can I adjust the 3D content inside ? You can adjust the 3D view by placing the camera in your website in the desired position. Or may be I didn't understand your question? and how can I remove or hide the Control Panel button?? You can do it by writing a custom application instead of using the standard Web Player. See programming tutorials on this website and the source files of the demos in your SDK to get an idea how to use the Blend4Web API. how can i remove 1,2 and 3 in the photo ? See this topic for the tip on how to modify the Web Player. Please note that you'll need to open source your project or buy a PRO license for that. 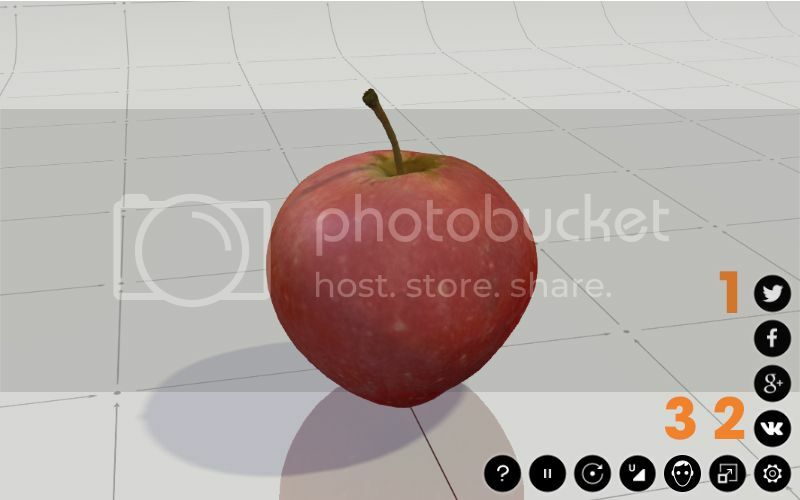 I would really like to know, how to add more Interactive 3D images on single web page. You can create several init functions and use them in different namespaces. For instance: init_1, init_2, init_3 - your functions. Ok, thank you. I had changed it and now it looks like this. But it still not work properly.